Here we are again! My favorite time of the year to be in Zagreb, when the city smells delicious because of the little red stands almost at every street corner… The strawberry season! Not only are strawberries delicious, but they lend themselves to all kind of culinary inspiration, from the classic jam to a more adventurous salad with arugula and balsamic vinegar, and of course different kind of cakes, like this one or the American-style rhubarb and strawberry pie I ate at Lari & Penati. Over the last year, my go-to strawberry recipe was what I call the “strawberry soup”: finely diced berries marinated with a touch of sugar and lemon, delicious as is, with chopped mint, or even basil leaves. No need to cook, the juice the strawberries let out becomes the soup itself. Tasty on its own, it becomes totally delicious spooned over some fresh skuta cheese, for example, or vanilla ice-cream. You will also need a baton mixer for this recipe, or any kind of processor allowing you to puree the fruits. First, dice the strawberries. You don’t have to chop them finely since you’ll use the mixer later. Add the lemon juice, then the sugar and mix well: the strawberries should start melting in the sugar. Add the cream and mix well one more time. 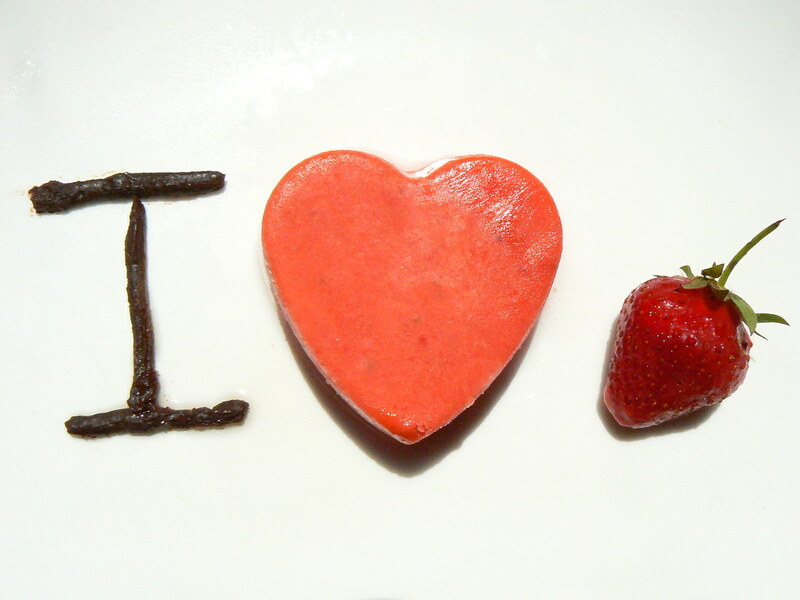 Using the mixer, puree the strawberries until you have a really smooth liquid mix. This step is very important, since if there are bits of fruits left, they will become like ice cubes when freezing. Pour in forms, plastic tubs, etc. and place one night in the freezer. 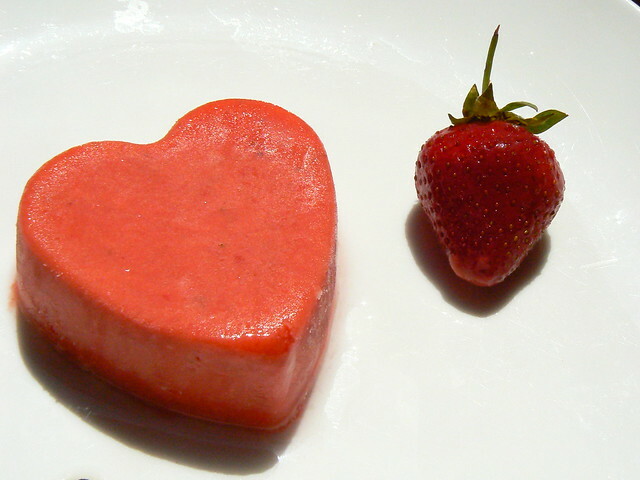 Any container that can take cold temperatures will do – here I used heart-shaped silicone forms. The ice-cream will keep up to a year in the freezer, allowing you to indulge in your favorite fruit all year long… if you manage not to eat it right away! Let the ice-cream thaw a little bit so it it easier to scoop or cut, and enjoy on a warm spring day! mmmm sounds almost perfect but I must add, do not forget “les éventails”, “les langues de chats” and eventually “les cigarettes russes”, ask Clem for the details !